I'm so excited to announce my dear friend, Dawn Crandall's, third book came out this week. It's the final addition to The Everstone Chronicles, and it features Estella Everstone. Here's the blurb for The Captive Imposter, and we'll chat on the other side! This third book in The Everstone Chronicles shines as brightly as the first two. Crandall has a knack for creating beautiful settings. Staging Estella's story at a mountainside resort allowed her to fashion a rich and colorful background to play this story against. Life has placed Estella Everstone in an unwanted position. But as she pretends to be someone she's not, she discovers who she truly is--and finds love. The fact that Dexter can see her better than many of the people she's grown up with tugs at her heart and encourages her to become a better person. In her natural way with words, Crandall crafts an endearing story with characters you become attached to, making it hard to place the novel down. She also proves, once again, why her books often make the Most Sigh-Worthy Kiss lists. 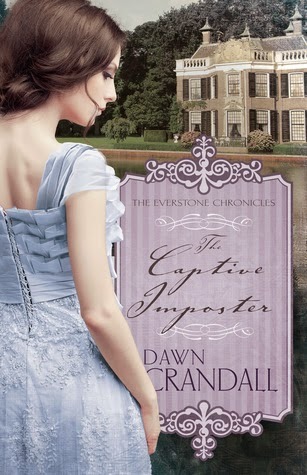 You can pick up your copy of The Captive Imposter here. Enjoy! ALSO, Dawn is giving away one copy to a lucky winner here on the blog. Leave a comment here OR on this post on Facebook and you're entered:) I'll announce the winner next Friday. Hi Emilee! I hope you'll get the chance to read the first two books in the series first--although it makes perfect sense on it's own, you really will get much more enjoyment when you read them together. :) Good luck! I requested them at my library. I've read the first book. I'd love to read the rest. They were all wonderful! You're entered! Wow, that summary! Is she in hiding because they don't know who her brother's murderer is or to keep her safe from the killer? =) Thanks for the chance to win. For her safety:) and you're so very welcome. You've been entered! Sounds like a great story! Thanks for sharing. I hope you'll get the chance to read the first two books in the series first--although it makes perfect sense on it's own, you really will get much more enjoyment when you read them together. :) Good luck! Sounds like a great book to read. It sounds like a real page turner. Thank you for the giveaway. I have seen so many wonderful reiews of your books, Dawn! Congratulations on those fabulous reiews and for providing readers with such beautiful description. Please enter me in your contest. I haven't had the please of reading your books yet, but I'd love to begin! Thank you for reading the reviews, Nancee! They blow me away! Good luck in the giveaway! This book sounds great. I would love to read them all in order. It impresses me how you took care of a new baby and wrote too. My hat off to you. Excited to read this book!! Thanks for entering the giveaway, Sierra Faith! I would love to win this book! I haven't ever read this author but I love to find new authors that I enjoy! Hi Brenda, I hope you'll get the chance to read the first two books in the series first--although it makes perfect sense on it's own, you really will get much more enjoyment when you read them together. :) Good luck! The Hesitant Heiress is on my "to read" list for this month. Would love to win book 2 and 3 so I can complete the series and read them all!! I have you all down! Cannot wait to see who wins! Sounds like a great read! Thanks for a chance to win! I just started reading the first book in this series and can't wait to make it through to the 3rd! Thanks for the great giveaway! Sounds like an interesting book. I'd love to read it. I have this series on my 'to read' list. Thanks for the chance to ein! I am excited for the chance to win one of your books! Thanks and congratulations! I've not read any of the Everstone Chronicles--but they look right up my alley! Thank you for the chance to win this one! I would love to read this book! Thanks for the oppurtunity! Oh how I'd love to win one of her books. Thank you for hosting this!